We constantly track for stock which ensures you will be the first to know when availability is found. Recommended retail price £7.99. 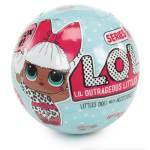 We constantly check for LOL Surprise Doll stock, so you don't have to. Receive email alerts when LOL Surprise Doll online stock is found.